I love to bake and cook. If it’s not dishes and can be done in a kitchen, I’m all over it. It’s very therapeutic, measuring, mixing, spooning. I also love creating something from nothing. Well, not nothing, but you know what I mean. Being half Italian, I was raised on pasta. Spaghetti, ravioli, lasagne, manicotti, rigatoni, etc etc etc. But it typically came in a box. My gram occasionally makes homemade chicken noodle soup, but that was really my only exposure to homemade pasta. 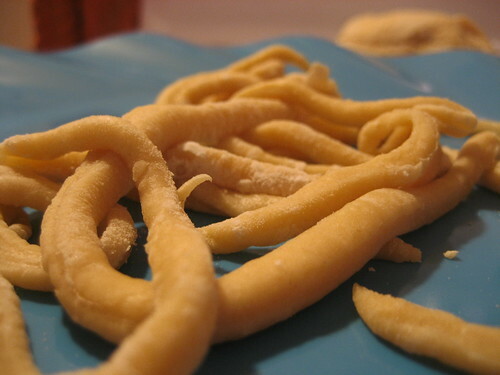 Earlier this week, I was reading through Google Reader and saw that The Pioneer Woman had posted a recipe for homemade noodles. Two weeks earlier, Keith (the sweetheart that he is) bought me a rolling pin. 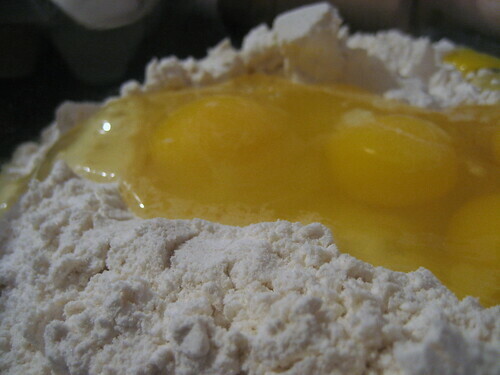 The recipe calls for 2 eggs per cup of flour. I used 4 eggs and 2 cups of flour because I didn’t know what I was doing and wanted some room for error. You could probably go for 3 eggs/1.5 cups of flour for 2 people, as I had some leftover. I also added some salt because I love it. You build a well in your flour and mix by hand. When it’s all combined you dump it out onto a floured surface. The only flat surface is my cook top, so there it went. 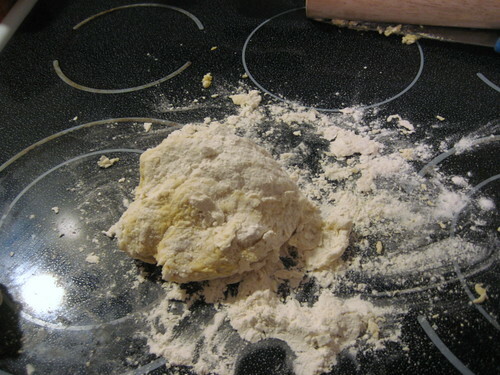 Then you knead. For ever. Or until the dough isn’t tacky and sticking to your hand. I had a layer of dough stuck to my hand after that I had to scrape off, but the dough eventually stops sticking to you. You then let it sit for a bit, before rolling it out. I have no idea why, I just do what I’m told. 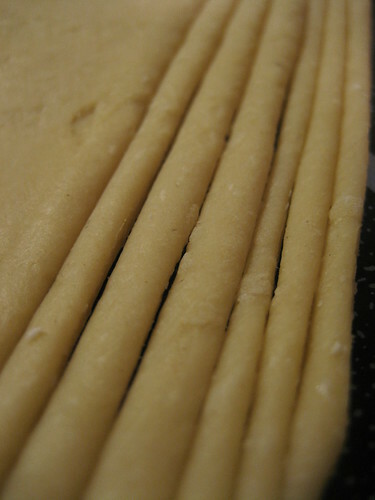 I rolled out the dough and used a pizza cutter to slice the noodles. They expand in the water, so I found mine were entirely too thick. The third from the right is probably about the size you want. And then where I went wrong. I tossed the noodles onto a plate haphazardly and let them sit there. For a while. How long a while is, I have no idea, as Keith showed up at this point and I got distracted. A while later when I went to cook them…they were stuck. Sadly I don’t have a picture of the mass, but Keith referred to it as a funnel cake, and that’s exactly what it looked like. I recruited him to help peel off noodles but by the end I just ended up rolling out the mass again and re-cutting them. Overall? They were decent. They were entirely too thick and therefore undercooked a tad (the recipe said 2 minutes, but mine probably could have used 3-4). I think they would be AWESOME in a soup, but as for topped with sauce, they were edible, but not magnificent. I will conquer them one day, promise.